I noticed these pumps a while back when I was trying to find a cheaper version of J.Crew’s Mona Suede Pumps in a similar Berry color. 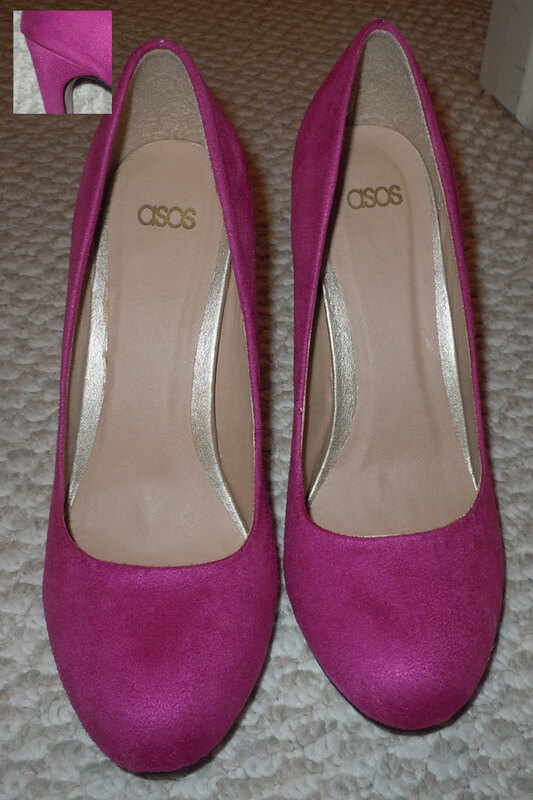 At $45.45 and free shipping, these ASOS Scala Pumps were a steal! I was pretty excited to get them. My excitement waned when I looked at the shoes. Very poorly made. As you see in the inset picture above, one of the heels are not aligned with the base. Upon further examination, the shoes looked like they were made out of cardboard. It felt like cardboard too. At a heel height of 4″, I was afraid these shoes might not support my weight. This shoe will be returned. Well thank goodness for Free Shipping and Free Returns. Though with ASOS, their returns take a long time to process. It´s really disappointing that for brands like that, they undermine their quality. I definitely vote for quick return.